Electronic for Imaging Building — Sky Rider Equipment Co.
Electronics For Imaging was a retro-fit project. The existing building had a Socket and Davit System around the entire roof. In some areas the parapet was 16 feet tall, and the existing sockets had been designed to “climb” a column in order to elevate the suspended platform and clear the tall parapet. These devices never worked and were red tagged by OSHA. Sky Rider was contracted to provide an elevated, parapet track system to support a new Davit Carriage System and 4-Line Self-Powered Platform. Additionally all of the existing roof mounted pedestals were provided with adapters for installation of Sky Rider Davits and Portable Sockets. The Powered Platform was modular to convert to the various required lengths, with one end converting into a Single Man Work Cage. The new track system is not only safer, meeting all OSHA codes, but much more efficient. Workers can move the platform to any work position along the length of the track without the need to land the platform on the roof. 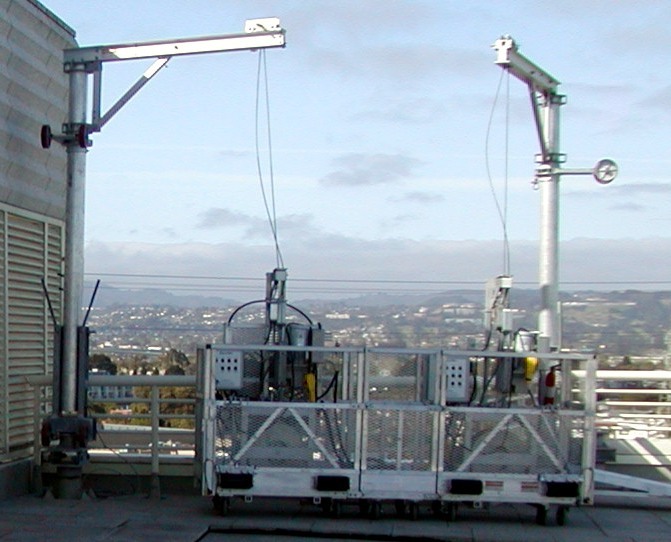 The modular platform is constructed with Tirak XE700 hoists, with dual powered wire winders and integrated electrical controls. In addition to standard limit and overload sensing devices, special push-out bumper rollers and mullion track guides were designed to permit use at a sloped façade. A full color, detailed OPOS (Operating Procedures Outline Sheet) and operating and service manual was provided. For further details on this, and other Sky Rider products and services, please do not hesitate to contact us.